The Lodge crest is the core defining talisman for Possum Lodge. 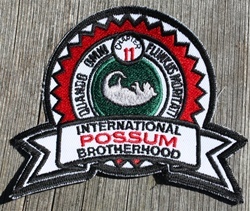 To be a member of the International Possum Brotherhood is one thing but to be a member of Chapter 11 is an honour that outshines any forensic audit. 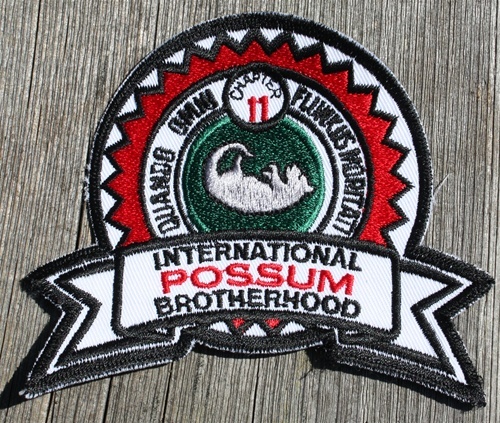 Containing the Possum Lodge oath `Quando Omni Flunkus Moritati` (When all else fails, play dead) and being of a shape and size that makes it suitable for sewing onto your fishing vest, prison smock, or straight-jacket, the Lodge Crest is a must-have for any Lodge member who`s committed or should be. You could expect more but hey it's Red Green. When the size of the pin is the same as Reds' brain, you'll think you're gettin a deal. The name pinhead comes to mind but in a good way.